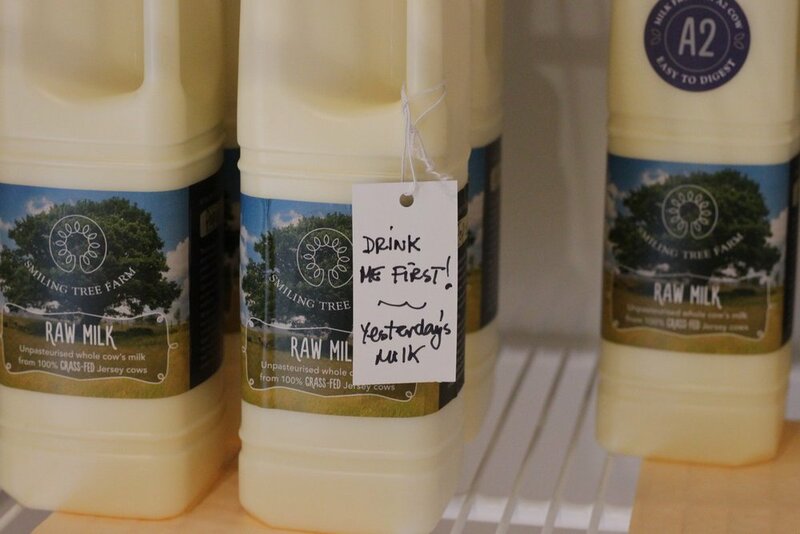 Audio: Eric and Clare speak with Christine about her micro dairy's raw milk Jan 2017 (source). Video: See Christine speak about her dairy in this video at the 42 minute time marker. Video by the Sustainable Food Trust. This event with Joel Salatin was filmed at Fir Farm in Gloucestershire, which took place from 24th - 25th November, 2016. Joel talks about how the safety of food is being confused with the sterility of food, and how this is impacting farmers; Nina talks about the role of the Food Standards Agency and how they hope to educate consumers about the risks of food; Thomas speaks about his experiences in Denmark, setting up a vertically integrated food business; and Christine explains how small-scale on-farm processing is vital for her farm in Shropshire. Download Christine's powerpoint slideshow here. Smiling Tree Farm has a microdairy of only 7 Jersey cows who are grazed all year round on organically grown pasture. They eat grass, clover, wildflowers and a diverse mixture of highly nutritious herbs. In the winter this diet is supplemented with home-grown hay from these same pastures. It is very important to Christine that her ‘grass-fed’ cows really are 100% grass fed. They never get grains, soya, root crops, brassicas or silage. These are not part of a cow’s natural diet and they can all have detrimental effects either to her health or to the taste and quality of her milk. Christine's website says that grains are a particular problem as they adversely change the composition of milk, alter its healthy balance of fats and inhibit the activity of the natural enzymes and beneficial probiotic bacteria. See this article to learn why science say 100% pasture-raised is best. and there is an emphasis on the animals' quality of life. Christine has written a series of articles about Cow-calf dairying looking at the practicalities of producing ethical, cruelty-free milk by allowing dairy cows to keep their calves. It covers why conventional dairy cows don’t keep their calves and why humanely-produced milk using cow-calf dairying is rare and costs much more to produce. Christine say that flavour start in the soil. To read more about what makes the milk taste so great, click here. Christine is also involved in networking with like-minded dairy farmers such as pioneer Fiona Provan from The Calf at Foot dairy and like-minded organisations such as the Pasture-Fed Livestock Association, Regen Ag UK, 3LM and others. Christine also hosts educational events on her farm such as this Micro-Dairy Gathering in June 2017. Christine is a true inspiration and a beacon of light for people who want to follow in her footsteps. Image: Popcorn demonstrates grass-over-their-knees. Christine says it's good to know that renowned Australian soil-microbiologist Dr Christine Jones advocates starting to graze with the grass at knee height and taking them out before you can see their feet. This way feeds the soil microbes, sequesters carbon and is a sustainable way to convert grass, a substance we can't digest, into magnificent raw milk, that we can. Clever cows! In this video, nutritionist and writer Daphne Lambert of Greencuisine shows why we should be moving towards the ethical production of dairy and plant based milks in order to live in harmony with our environment. She visited two raw dairy farms: Smiling Tree Farm microdairy and the larger biodynamic Plaw Hatch Farm. Audio: The following is from the workshop The Absolute Importance of Microdairies (source) published 4 Jan 2017. It is for anyone interested in starting a microdairy or perhaps a landowner with land for a microdairy. The workshop is also for those who want to find ways of adding value. The Oxford Real Farming Conference have kindly made this audio available to everybody interested in micro dairying. Speakers: Simon Fairlie (Monkton Wyld), Robert Fraser (Herefordshire farmer), Nick Snelgar (Maple Field Milk CIC) and Christine Page (Smiling Tree Farm). Click here to download Christine's PDF Powerpoint slide. Video: Christine Page talks about the start of the 2016 season of mob-grazing her micro-dairy herd of 100% grass-fed Jersey cows, including showing some electric fencing tips and watering the cattle. Image: one of Christine's latest milk hygiene test certificates. Her micro dairy's results are likely one of the lowest in the country because as a micro dairy more attention to detail can be achieved, 19 November 2017. Click to enlarge. 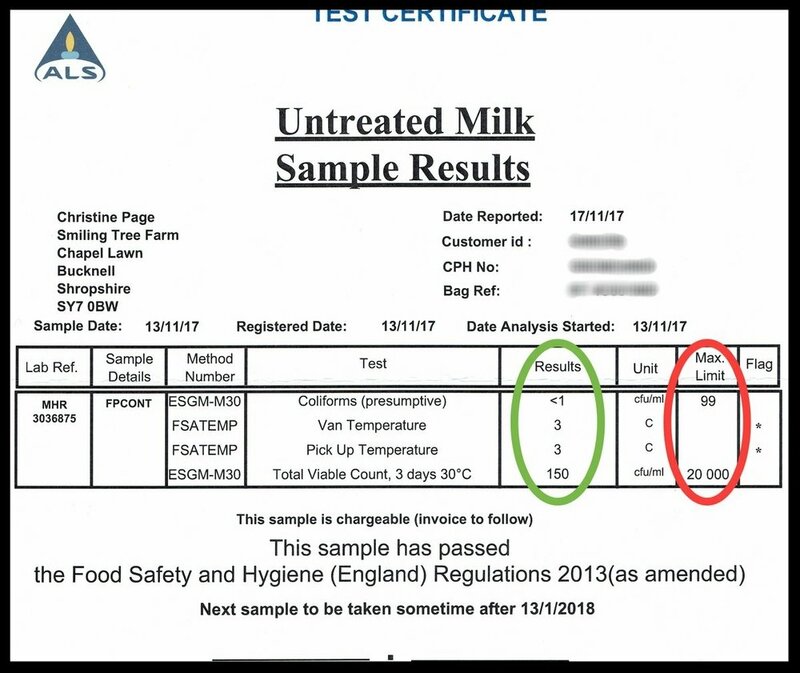 Image: this test result from October 2017 shows how low the Bactoscan and Somatic Cell Count (SCC) can be in a microdairy producing raw drinking milk. According to the information from another microdairy the Bactoscan should be below 100, and the SCC should be below 400. The Facebook post also said: "The UK average for both in November was 29, and 154." Eric Smith and Clare Ashford interview Christine. Why you should eat real food…that eats real food.